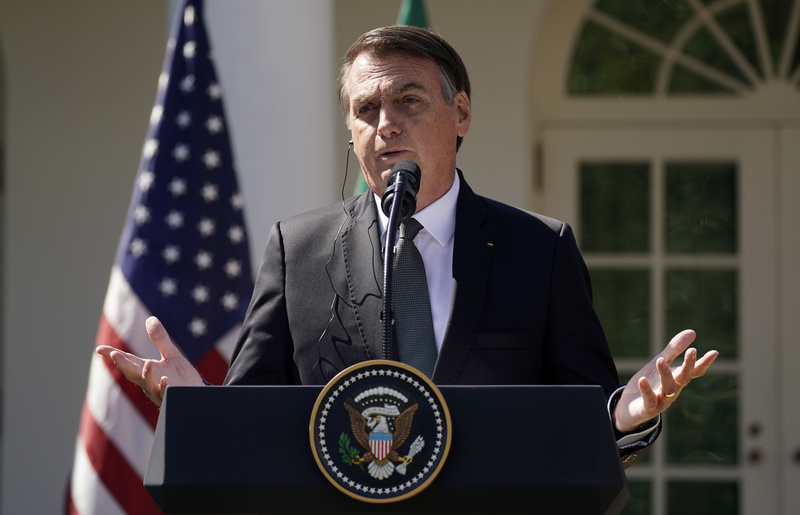 Brazil's President Jair Bolsonaro speaks during a joint news conference with U.S. President Donald Trump in the Rose Garden of the White House in Washington, U.S., March 19, 2019. Brazil’s benchmark Bovespa stock index was down around 2 percent in early trading on March 22, while the real was around 2.5 percent weaker against the dollar. The slide followed the arrest a day earlier of Michel Temer, who was president of Brazil until the end of 2018. He was detained as part of a probe into alleged corruption, including in the building of a nuclear power plant. The country’s current president, Jair Bolsonaro, met his U.S. counterpart Donald Trump in Washington on March 19. Diplomats and officials said Bolsonaro, who took office on Jan. 1, won few immediate concessions in return for waiving visa requirements for U.S. visitors, offering a tariff-free wheat import quota and making it easier for U.S. companies to conduct space launches from Brazilian territory. The popularity of Bolsonaro’s government has fallen sharply since he took office, with just a third of respondents saying it is doing a good or great job, down from 49 percent in mid-January, according to a poll published on March 20. That is the worst approval rating at such an early stage of any government since the return of democracy in the late 1980s. The percentage of those surveyed rating Bolsonaro’s administration as bad or terrible rose 13 percentage points to 24 percent, pollster Ibope said.